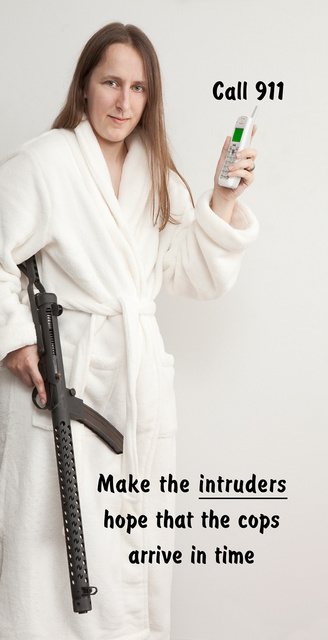 ← “Home Defense” isn’t about homes. This is one of the few semi-auto arms I like as much as the select-fire original. It’s longer barrel (16″ vs. 10″) gives it a longer sight radius, and the two-flip aperture is more familiar than the quaint diffusion disk sight of the original. Close-bolt firing means rather better accuracy: at 25 yards, the entire 34rd magazine goes into one 2″ hole. The folding stock is among the most solid of any carbine. Central balances allows easy one-hand control. Magazines are reliable and easy to load.The only down side is the all-metal construction can get hot or cold, depending on your climate. A para cord or an inner tube wrap solves that concern. This entry was posted in rifle, self-defense, weapon and tagged 9x19, carbine, defense, home, phone, Sterling, white. Bookmark the permalink. I am sure envious of your toys and models!